You'll be £10.00 closer to your next £10.00 credit when you purchase Napoleon on Campaign. What's this? These are the magnificent works of Detaille, Meissonier, Vernet, Lady Butler, Hillingford and many of the other artists who sought to capture on canvas the most celebrated incidents of the Napoleonic Wars. Through their battle paintings these great artists tell an intriguing tale, of power, greatness, greed and hubris. Each image is captivating in its own way and opens the door to a bygone world of martial splendour. The rise and fall of Napoleon makes for a gripping, and tragic story, and these great works inside are arranged chronologically in order to let the images do the talking and provide an opportunity to allow the reader a unique chance to revel in the glorious and timeless work of the artists. Gathered together in a single volume for the first time this wonderful book makes for essential reading for anyone with an interest in the Napoleonic era. An unusual and affective account of the Napoleonic Wars. This book is as important as any of the magnificent photo albums I have seen this year reliving the Great War, Vietnam and other horrors. If you are a military history enthusiast and whether you have a profound or passing interest in the Napoleonic Era, you will find this book a valuable addition to your library. 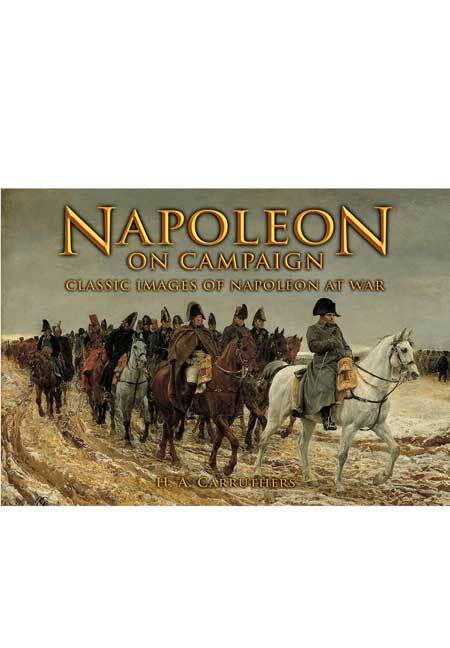 The book features a collection of paintings from famous artists like Detaille, Meissonier, Vernet, Lady Butler, Hillingford… depicting Napoleon on campaign. ... I would recommend this book to anyone interested in the Napoleonic era whether a modeler, general historian or art enthusiast. The quality of the prints is the saving grace of this book, ranging from Fernand Cormon's action-packed battlefields to Edouard Detaille's gritty realism and Horace Vernet's populist romanticism. [So] when you find yourself gazing at some of these images as if standing in an art gallery, temporarily lost in the wash of colours and chaos of this tumultuous pocket of a bygone age, you're tempted to just drink it all in and enjoy.